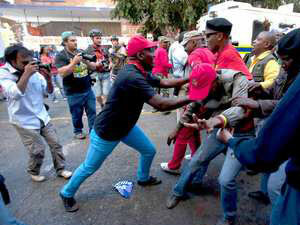 Tuesday's DA led demonstration against government's proposed wage subsidy for young citizens resulted in violence on the streets of Braamfontein when Cosatu members objected to the demonstration. The DA supports the wage subsidy, believing it will help young people get employed and gain essential experience in the workplace, while Cosatu believes it will lead to currently employed workers losing their jobs, further exploitation of the labour force and lower wages (as if workers wages aren't poor already). Unfortunately both sides have good, valid points. From Cosatu's side, they are likely correct to believe the subsidy will lead to reduced earnings and exploitation, while the DA is right to support any means to create employment in South Africa. Government has once again came up with a good idea (intended to benefit citizens) without thinking the process through completely. The proposed wage subsidy makes no mention that the subsidy should only be granted to employers hiring young trainees for NEW positions, and offers no protection for existing employees. A carefully considered bill would have contained legislation with strict requirements for the subsidy awards. But as always the ANC government approached the matter in it's usual ad-hoc manner. The DA can only be considered misguided in their support of this wage-subsidy. Clearly the bill was bot examined thoroughly with consideration given to the bigger picture. Locking horns with Cosatu at this time seems a attempt at simple politicking, rather than a well thought out action in support of the workers of South Africa. The DA is trying hard to overcome the impression held by many they are a party for big business and the rich, an impression they reinforce constantly with statements in support of less stringent worker-unfriendly labour law, support of vested interest financial 'analysts' (who are invariably employed by these big business interests). Undeniably unemployment and poverty is a major problem faced by South Africa today... Loosening labour legislation regarding conditions of employment and minimum wage levels is however not the answer, and as Cosatu correctly says such measures will only lead to further exploitation of an already underpaid workforce. While the subsidy if properly introduced with the mentioned safeguards could be one tool in the arsenal against unemployment, it will make little difference to the overall situation. The only way for South Africa to address the issue of unemployment is to scrap the policy that has proven contrary to business growth in SA; employment equity (black economic empowerment). South Africa must encourage and support the existing base of business and technical skills that existed pre-1994 regardless of previous affiliations or skin colouration. Legislation is needed to stop our currency being exported when international business buys shares in SA business. Funds are needed for small business to develop and grow... Proposed small business initiatives are racist in their application and will simply be lost to the flood of illiterate and in-competent BEE recipients.